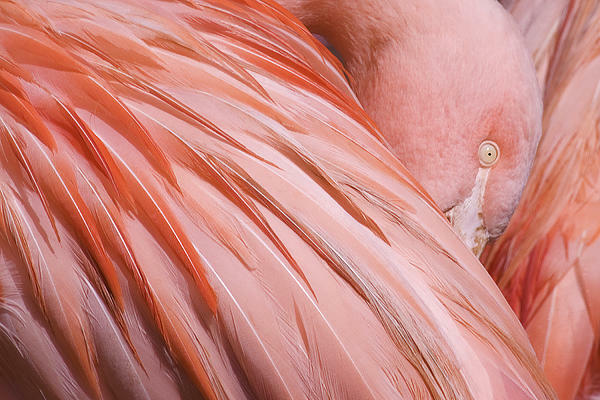 This flamingo was photographed in a private zoo in France where it had it's beak tucked into it's wing taking a nap. Another flamingo's bumped it making it's eye pop open for this one shot. The main entrance of the zoo has a huge enclosure with hundreds of flamingo. 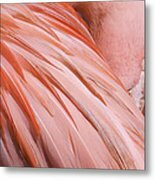 This colorful flamingo was very actively preening his beautiful feathers. This was after it's eating and having vocal and beak smacking with other flamingos. Even though it is very loud and many birds arguing with each other there never seemed to be any real injuries. 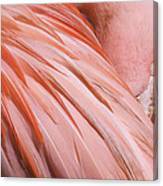 These elegant wading birds are mostly found mostly in Africa and in the Americas from the genus phoenicopterus. This tongue twisting word is Greek meaning blood red feathered. 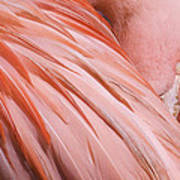 Their plumage ranges from deep reds to light pink and sometimes a bit orange.